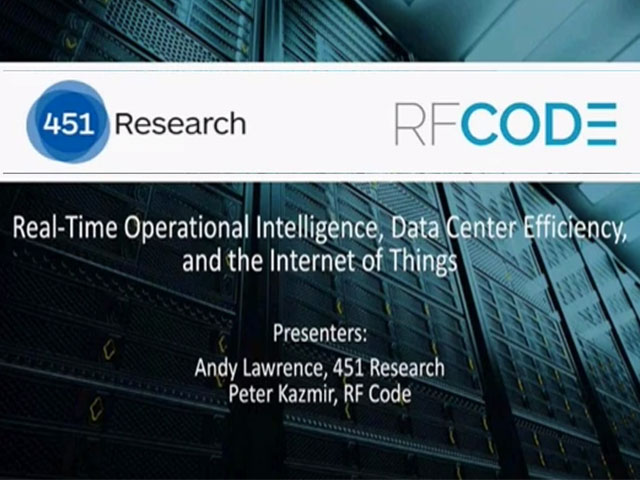 451 Research’s Andy Lawrence and RF Code’s Peter Kazmir engage in a thought-provoking discussion of the impact of real-time, wire-free solutions on data center asset lifecycle management and environmental monitoring, and the ways in which they vastly improve data center management and operational efficiency. RF Code is the only integrated, scalable Real-Time Operational Intelligence platform that delivers the automated asset management, real-time tracking, and wire-free monitoring that you need for the accurate capacity planning that drives bottom line return on every physical asset in your organization every month. With market-leading software to plan, manage, locate, monitor, and audit, RF Code ensures complete visibility, accuracy, and compliance across your entire data center. RF Code significantly reduces the total cost of ownership (TCO) in your data center by eliminating expensive and inaccurate manual processes, driving data-driven capacity planning and management, and ensuring every asset investment is available, deployed, and delivering benefit to your organization. This continuous flow of intelligence ensures an unbroken chain of custody for all assets and provides the data necessary for successful DCIM or ITSM implementations. And RF Code’s ease of integration with back office applications helps you accurately calculate your TCO and ensure the highest level of financial control available.